RAM – How Much is Enough? Is your Mac acting sluggish? Does it bonk during processor intensive tasks? If so, maybe it’s time to install an additional RAM chip or two. 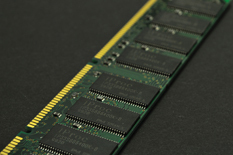 RAM (Random Access Memory) is memory for your computer – but a different beast than hard drive space. The more RAM you have, the more memory-intensive tasks you can do on your computer. What confuses people is that both hard drives and RAM are measured in GigaBytes (GB). Apple has been historically stingy when it comes to the amount of installed RAM when buying a Mac off-the-rack (although they’ve been less Scrooge-like in the past few years). But for those working with programs that are RAM hogs (mainly graphic artists, photographers and audio/video power users), an immediate upgrade is often mandatory. By clicking the More Info button in the About This Mac window, you’ll be able to see additional information about your computer. Click on the Memory tab in the left column, and you’ll be able to see the details of your installed RAM. To find out how much memory your computer is able to handle, go to a site dedicated to the specs of all Mac models. My personal favorite is LowEndMac.com, which, despite its name, has accurate information on every Mac, from current machines as well every model going back to 1984.